Join The Very Hungry Caterpillar for a celebration of everyone’s special day. 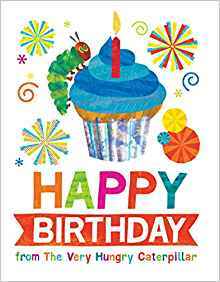 This beautiful book features Eric Carle’s bright, colorful artwork of birthday surprises–from presents to balloons, and of course, cake–with The Very Hungry Caterpillar making an appearance alongside each one. This book is the perfect birthday gift for readers young and old.